Person A presents the viewer with a series of linked panels of photographs of a woman carrying out a series of day-to-day tasks, such as shopping or reading. 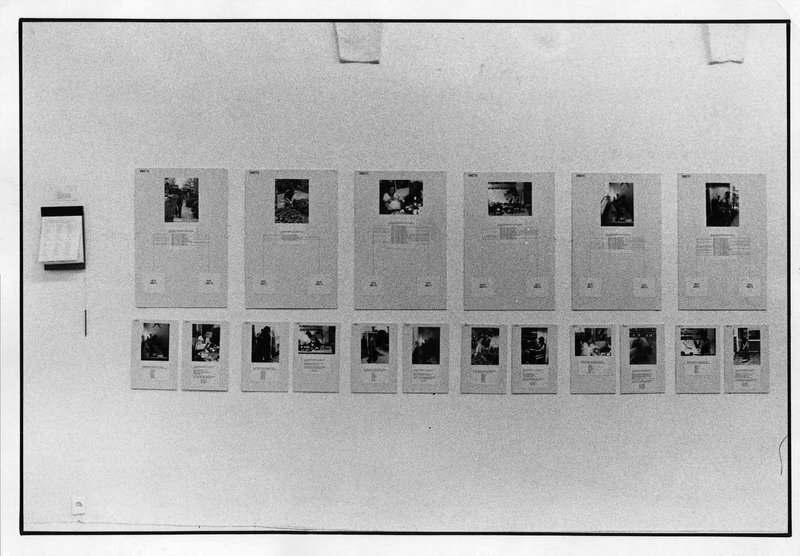 Willats’ interest in involving the viewer by way of a series of questions had been developed though project works he made in the early 1970. Person A was one of the first wall works that also used such a series of questions that lead the viewer to consider the way they perceive others and their intentions, their view of the relationship between motivations and actions. This requirement of interaction was further formalised though a response sheet that hung next to the work and that viewers used to set down their reactions to the questions. This method lead participants through a series of questions that would develop from the more descriptive to more abstract thinking. From the first panel of Person A, the viewers’ choice of responses from a thesaurus set out below the image, leads them in a certain direction and involve both perceptions around the event taking place to thinking about the woman’s state of mind at that particular moment. For a further discussion concerning this work, see: Life Codes - Behaviour Parameters, 1974 in the Texts section.